Brass bristle brush to clean leather prior to applying boot grease. 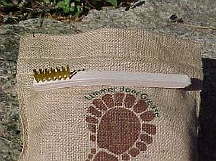 This brush will allow you to clean your leather without having to introduce water to the leather. With a soft brush you shouldn’t scratch the leather. Pay attention not to stay in one area too long.